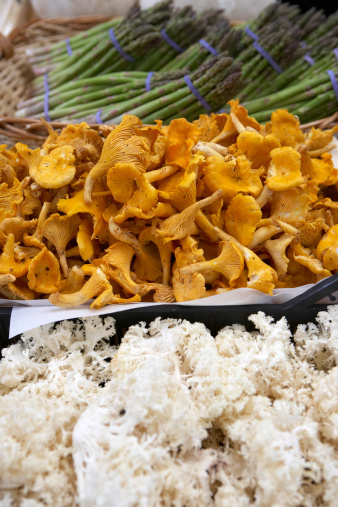 Kentucky holds a variety of edible mushrooms ranging from the medicinal Reishi mushroom (Ganoderma lucidum) to culinary oyster mushrooms, morels, chanterelles, boletes and honey mushrooms. Mushroom finds do not end at the woods' edge. For example, King Stropharia (Stropharia rugoso-annulata) are found on forest floors and growing on mulch in urban settings, notes the University of Kentucky Cooperative Extension. Kentucky is home to more than just the morel. The University of Kentucky suggests simply appreciating wild mushrooms in the natural landscape instead of harvesting them. The university usually errs on the side of caution, recommending against eating mushrooms gathered in the wild -- even cautioning extension agents who have been provided a sample of fungi to offer the same advice to mushroom hunters. 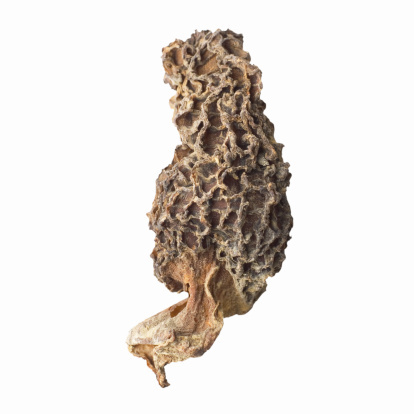 The reason for the caution being that, while the mushroom presented for examination may be safe, the potential exists that not every mushroom in the batch will prove edible. Carry a field guide to mushrooms. The University of Kentucky recommends guides such as "Mushrooms Demystified" by David Arora and the Audubon Society Field Guide to North American Mushrooms by G. H. Lincoff. Prepare to hunt following a period of warm, humid days, particularly during rainy seasons. The weeks during which spring transitions to summer is one period when you may anticipate good hunting. According to the University of Kentucky, mushrooms grow in the wild in Kentucky most of the year, but fall proves a good time to find diverse mushroom types. Look in nontraditional locations. Mushrooms do not grow solely in wooded areas or on decomposing logs; you can find them in places such as open fields and urban backyards. Widening your scope may provide a greater opportunity to discover fungi. Search the locations and conditions that fit the type of mushroom you hope to harvest. For example, maitake mushrooms (Grifola frondosa) grow in forested areas on dead and dying hardwood trees. Harvest mushrooms at the recommended stage of development. For example, lion's mane mushrooms are harvested "when the spines have elongated but before the top of the mushroom softens and becomes noticeably yellow or pink," according to the University of Kentucky Cooperative Extension. Handle mushrooms delicately. Their soft bodies are easily bruised or damaged. Twist the mushroom away at the base of the stem or cut through the stem with a knife. The University of Kentucky Cooperative Extension recommends storing mushrooms immediately in a container that allows air to circulate through. Consult an expert before consuming any mushrooms found and harvested in the wild. Experts include extension agents and naturalists. The University of Kentucky warns that some poisonous mushrooms may share a similarity in appearance with edible fungi. Alice Moon is a freelance writer with more than 10 years of experience. She was chosen as a Smithsonian Institute intern, working for the National Zoo in Washington, D.C., and has traveled throughout Asia. Moon holds a Bachelor of Science in political science from Ball State University. When to Pick Morel Mushrooms in Oklahoma?